(NEW ORLEANS, LA) – The Association of Pool & Spa Professionals welcomed its fifth cadre of Fellows during its Annual Awards Reception November 1, 2016, in New Orleans. 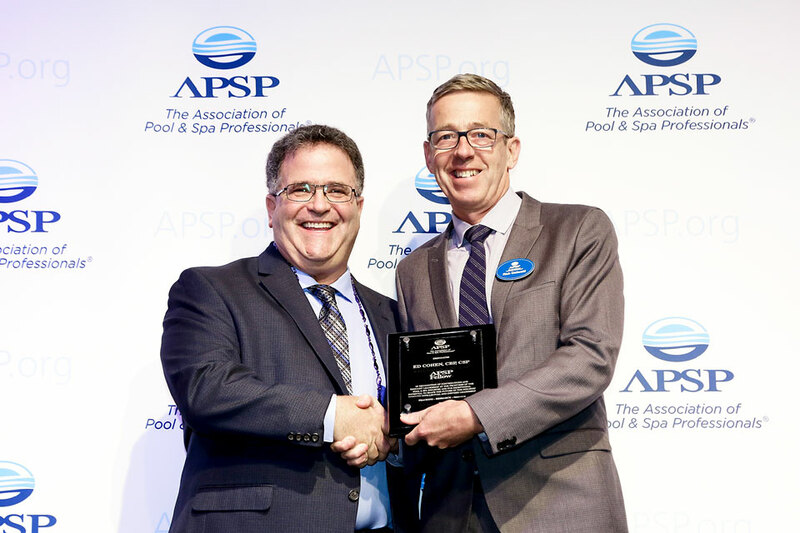 The rank of APSP Fellow is a peer-nominated honor bestowed on prominent individuals who have made distinguished contributions that raise the professionalism in the aquatic community through teaching, research and/or exemplary service to others. Among those included in this year’s awards is Ed Cohen, CBP, CSP, and CEO of Ultimate Pool Care/Chaikin Ultimate Pools. Ed follows in his business partner Kyle Chaikin’s footsteps. Chaikin, CBP, CSP, CPO and President of Ultimate in Pool Care’s Construction DBA—Chaikin Ultimate Pools—received the award last year in 2015. Each year, APSP honors individuals as Fellows. For more information about the program or this year’s awards, visit APSP.org/Fellows, or 10 Industry Leaders Named APSP Fellows. Ed Cohen began his pool industry career in 1980 in Long Island. Since then he has gone on to build one of the most respected pool companies in the tri-state area. The award-winning pool industry veteran has spent countless hours developing education curriculum as well as instructing training programs for the swimming pool technician. He has taught the art and science of leak detection in the tri-state and across the country for over 30 years. To keep abreast of the most up-to-date trends, product options and regulations impacting pool and spa owners, Cohen stays active in industry association’s including the Long Island Pool and Spa Association (LIPSA), the Northeast Spa and Pool Association (NESPA) and the Association of Pool and Spa Professionals (APSP) and the National Plaster’s Council (NPC). He is a Past President of LIPSA, and is currently an active board member LIPSA. Cohen is certified by the APSP as both a Certified Building Professional (CBP) and as a Certified Service Professional (CSP)–the highest education designations one can achieve in the swimming pool industry. His advanced education has earned him the NSPF SWD (National Swimming Pool Foundation Society of Watershape Designers) Associate status, while working toward his NSPF SWD Master Certification, currently scheduled for completion Spring, 2017. Cohen is noted as one of the nation’s top experts in swimming pool and spa leak detection. More than three-decades of experience along with high-tech equipment and his innate sense of discovery has lead Cohen to unearth and resolve nearly 9,000 leak issues. Ultimate in Pool Care, Inc. is a multi-faceted pool construction, service and management company located in Long Island, New York. Our award-winning pool company provides a full range of professional offerings for residential and commercial applications: from design and construction, to renovations and a comprehensive menu of maintenance and management services. Ultimate in Pool Care is fully licensed (pool service, pool maintenance and pool construction) as required by the counties of Nassau and Suffolk in the state of New York. Serving the tristate area for over 35 years, Ultimate in Pool Care, Inc. is comprised of three distinct units: Ultimate in Pool Care, Chaikin Ultimate Pools, and Chaikin Ultimate Management, delivering commercial and residential pool owners the ideal, stress-free experience. Ultimate in Pool Care oversees the maintenance, and service aspects of the company. Chaikin Ultimate Pools directs the construction and renovation aspects of the company, and Chaikin Ultimate Management operates the pool management unit. Visit our About Us pages to learn more about the company.